I proudly present my employee cafeteria dessert hack. We are fortunate to have a cafeteria at work. To keep things interesting, we periodically come up with new and crazy things to do with the basic ingredients we have to work with....such as the person who floated a grilled Swiss cheese sandwich in their French Onion Soup. That person was not me, but I do it now because it's brilliant. This week it was sandwich day in the cafeteria and we lucked out that we had an ice cream sundae bar as well. It's very rare to have cookies AND ice cream on the same day, so the minute I saw the big bowls of peanut butter and jelly, I knew what was going to happen. 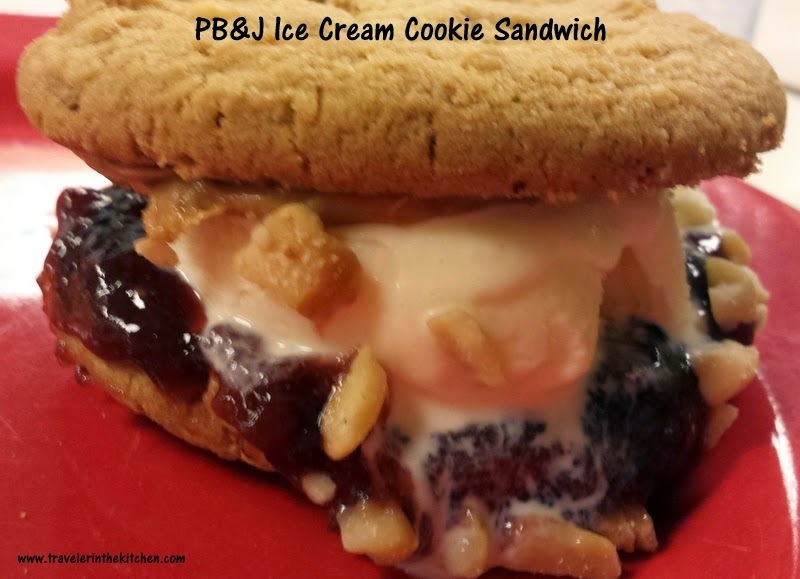 One big, bad, PB&J ice cream cookie sandwich. Spread jelly on the bottom of one cookie and peanut butter on the other cookie. Put the scoop of ice cream on top of the cookie with the jelly. Press the cookie with peanut butter on top. Garnish with peanuts if you're feeling extra creative.